Bibimbap is a signature Korean dish which literally means “mixed rice”. A dish that consists of cooked rice topped with vegetables and meat such as beef. It is just amazing that Pinoys loves this dish because whenever I go to a fast food court that serves this dish, people are lining up just to order and eat. I’m not sure if Mr. Kimbob serves an authentic bibimbap or they have adjusted the ingredients to suit the Pinoy taste. Because most Korean dishes are very spicy which most Pinoys can’t tolerate. But obviously it is not authentic because there is no gosari (fern brake) which most authentic bibimbap recipe has. One mistake I made is that I thought that the bibimbap sauce is ketchup so I drizzled it heavily on my bibimbap when I ordered in Mr. Kimbob. After mixing it up all the veggies, meat and rice, I took a spoonful and eat it. After a few seconds….it’s so hot my mouth is on fire. Bibimbap is a signature Korean dish which literally means "mixed rice". A dish that consists of cooked rice topped with vegetables and meat such as beef. Combine and mix ground beef, soy sauce, garlic, ground pepper and sugar. Marinate for 20 minutes. In a heated pan with 1 Tbsp. cooking oil, saute the beef mixture in a high heat for 2 to 3 minutes. If you are using dried shiitake mushrooms, soaked it first in hot water for a few hours before starting to make this dish. For fresh mushrooms, just wash it then slice thinly. Then saute and add soy sauce, sesame oil, sugar and stir for 2 minutes. Soak, wash and clean bean sprouts by removing the husk. Drain and blanch the sprouts. Season with salt, minced garlic and sesame oil. Set aside. Blanch the spinach for 1 minute. Then rinse in cold water and squeeze gently to remove excess water. Season with salt, soy sauce, sesame oil and minced garlic. Set aside. Then saute the zucchinis in high heat with some cooking oil. Saute until transparent. Set aside. Saute the carrots in a lightly oiled pan over high heat for 1 to 2 minutes. Season with salt and pepper to taste. Set aside. Combine the bibimbap sauce ingredients in a small bowl. Mix thoroughly until smooth. 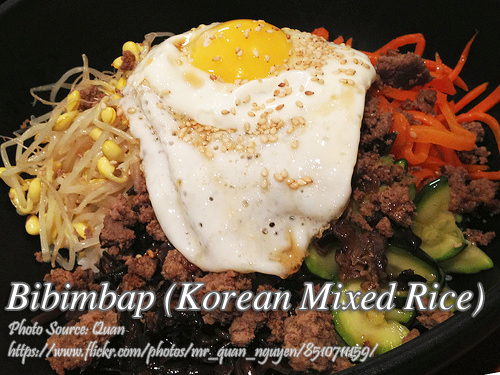 If you want to have a sizzling bibimbap like the one you see in Mr. Kimbob, you can use a round deep sizzling plate. Bush the inside of the plate with sesame oil and heat over the stove until a wisp of smoke appears. Mold a cup of rice and place in the center of the plate. Then nicely arrange a small amount of each prepared vegetables (bean sprouts, zucchinis, carrots, mushrooms, kimchi) and beef around the rice. Just like what you see on Mr. Kimbob. Then top with fried egg and garnish with spring onions. Serve with bibimbap sauce. Hi, thank for this bibimbap recipe. It’s quite a lot of ingredients and I thought bibimbap is a simple to cook dish. Hi Mira, don’t be overwhelmed by the amount of ingredients. At least after you cook this bibimbap it’s as close as you can get on an authentic Korean bibimbap. Hiiiii how do you make the bibimbap sauce? Hi Chien, just mix the bibimbap sauce ingredients.